RIM might be having a bit of hard time adapting their smartphones to the rapidly changing market but it might turn out that it’s all because they have been focusing their efforts elsewhere. The company just entered the tablet market with a bang, announcing their 7-inch BlackBerry PlayBook, running a new BlackBerry Tablet OS. Coming with a SVGA (1024 x 600 pixels) multi-touch capacitive touchscreen, the PlayBook is the first tablet to sport a dual-core 1GHz CPU. And it makes quite good use of it too – both the front-facing and the primary camera of the device are capable of recording full HD video (yeap, that’s sweet 1080p footage) and on board the PlayBook has what RIM calls “true multitasking”. And with 1GB of RAM you are unlikely to have “out of memory” issues either. But it doesn’t end there – there’s also Flash 10.1 and HTML5 support, microHDMI and microUSB ports and Wi-Fi a/b/g/n support. The primary camera can also take 5 megapixel stills, while the secondary one does 3MP. Secure Bluetooth connection is here too with 3G the only notable absentee. RIM are however promising 3G and even 4G versions of the tablet too. All that goodness is packed in a body only 10mm thin and weighing 400 grams. Oh boy, is that exciting or what? Check out the official promo video of the new tablet. 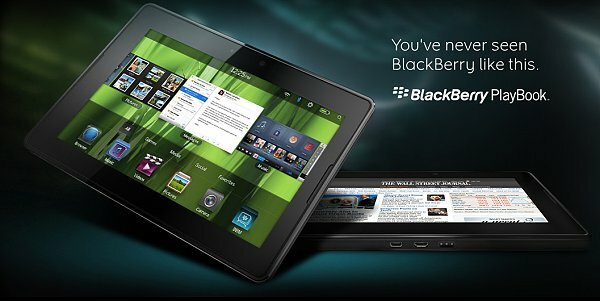 Now for the bad news – the PlayBook won’t hit the market until early 2011 and the worldwide availability is coming in Q2 2011. Unfortunately we are still unaware of the target pricing of the PlayBook.